We have just crossed the half way mark of this mega marathon of ABC Baking around the world. We are starting a new week today with the letter, N. N for Nissua ~ A Cardamom Bread from Finland. This Holiday bread flavored with Cardamom is traditionally made both in Finland and Sweden. In Finland it is also called as Pulla whereas in Sweden it is known as Kardemummabröd. Trust me when I say that this Cardamom flavored bread was a pleasure to have and the whole house was smelling divine. I wish I had baked a larger batch of this bread. But since I have been baking too many breads, I guess it is okay to bake in smaller batches to spare some extra calories :). Before we go over to the recipe, here are the bakes from the past fortnight..
Sprinkle a teaspoon of sugar in warm water and yeast. Let it rest in a warm place for about 8-10 minutes until it froths up. Meanwhile in a stand mixer bowl, add the flour, salt, sugar, cardamom powder, warm milk and butter. Pour in the yeast solution and knead for about 8-10 minutes until the dough is smooth and elastic. Punch down the dough and divide into 12 equal portions (as I wanted smaller breads). Knead each portion and roll them into 9 inch ropes. Take three ropes at a time and braid them together tucking the ends securely. Brush the braids with milk and bake them for 20 minutes or until the tops are golden brown. Remove from the oven, brush with with butter and enjoy as per preference. Beautiful braiding and boy you have 4 loaves , what more ! Harini I have loved all your breads , may be I am repeating this but truly I wait for a new awesome bread everyday ! Super ! How beautiful those Nissua looks, prefect braiding Harini. A prefect bread to kick start a day with. I can't take my eyes off these beautiful braids Harini, simply awesome! There is nothing like a bread that looks and tastes good. Gorgeous! The braiding is so beautiful. Cardamom flavoured bread is making me drool now. Lovely pick for N. Am bookmarking this to try soon! My choice was this too for P..I had to change as I knew I won't be able to bake a bread..wonderful bread and I know I will be surely baking this soon..
Who can say no to this cardamom bread. Those braids have come out very well. I love cardamom in bread -- makes it taste so aromatic and delicious. You have beautifully braided those loaves and they look stunning. Omg look at those beautifully braided breads. I am loving those braids. Bookmarked to try . The braids looks so perfect.. Just love this bread!! 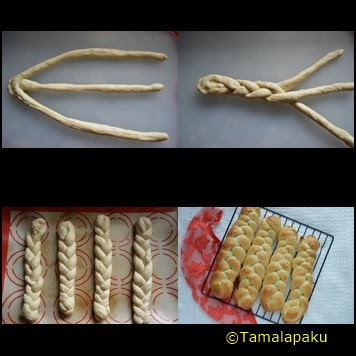 What a lovely pick for the alphabet and absolutely love the perfect braiding that you have done with the bread.